I'm back with some more recordings from the Richard Dawkins Book Tour. Yes, I am a stalker! 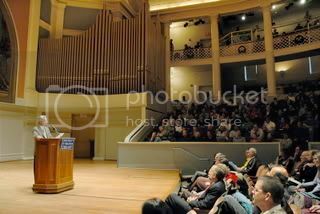 Dawkins decided to make his stop in Charlottesville special by speaking two days in a row, once in celebration of the 30th anniversary of "The Selfish Gene," and again to commemorate the life of Thomas Jefforson and the secular nation he helped establish, as well as the University itself. I will post the first talk's readings because Dawkins chose to change things up by adding in comments from "The Selfish Gene" and "Climbing Mount Improbable." 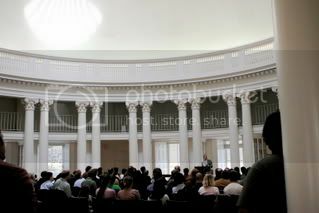 The second day's talk was identical to Dawkins' other stops with the exception of a few more quotes from Jefferson, and that Dawkins called the Rotunda building, in which the talk was held and is the feature peice of the University, a "temple of reason." You could tell he was really moved to be speaking in such a historic place. The readings from the first talk commemorating "The Selfish Gene" as well as "The God Delusion"
The links take me to an Error 404: File Not Found. Fixed! Sapient hadn't uploaded them by the time I had made my post, but they're up now. Oh and something I forgot to add was that at the beginnig of the second question session, Dawkins describes his daughter, and gets very emotional about his daughter. You could see he was holding the emotion in, and in fact he almost shed a tear. Passionate man! Richard Dawkins is awesome! The God Delusion is a great book. I was there, Tomcat. Was the 6 yr. old in question his daughter? Where did you sit? If you saw the guy in the blue jean jacket with long hair then that was me. 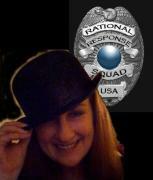 I have also updated the original post to include links to pitures of both day's events at UVA. The first set are by Eric Dobbs of the Richmond Reason and Naturalist Association, whom I had met along with two other RRNA members on the first day of Dawkins' stop. My mind wasn't made up on making the trip until after the Thursday show. The fall colors were nice. Seemed like a very clean campus. It was just boring for a Friday night/Saturday morning. By the way, he's featured in the most recent issue of "Time" debating a theist scientist.